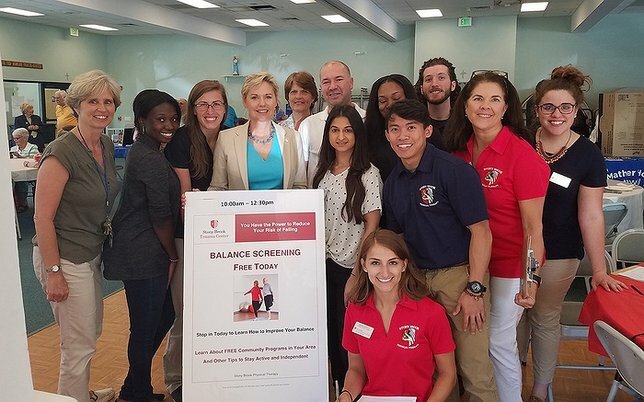 On Friday, June 29th, Suffolk County Legislator Sarah Anker and the Stony Brook University Hospital Trauma Center hosted a Senior Health and Wellness Expo at St. Mark’s Church in Shoreham. Suffolk County Legislator Sarah Anker at the Senior Health and Wellness Expo. Shoreham, NY - July 3, 2018 - On Friday, June 29th, Suffolk County Legislator Sarah Anker and the Stony Brook University Hospital Trauma Center hosted a Senior Health and Wellness Expo at St. Mark’s Church in Shoreham. Among the services offered at the expo were free health and balance screenings by Stony Brook Medicine, free senior identification cards from the Sheriff’s Office, and refreshments were donated by the Rocky Point Stop and Shop. The Suffolk County Police were also present for Operation Medicine Cabinet, a drug take-back program that allows resident to safely dispose of unwanted or expired medications. “I am proud to partner with the Stony Brook University Hospital Trauma Center on this important event every year to help raise awareness of the many senior programs available throughout Suffolk County,” said Legislator Anker. The participants included: the Stony Brook University Hospital Trauma Center; Stony Brook University Hospital Physical Therapists; Stony Brook University Hospital Urology and Women’s Pelvic Health; Stony Brook University Hospital Carol M. Baldwin Breast Care Center; Stony Brook University Hospital University Vascular Center; Suffolk County Department of Health Services; Suffolk County Department of Social Services; Suffolk County Office for the Aging, Suffolk County Police Department; Suffolk County Sheriff’s Office; Suffolk County Veterans Services; Suffolk Independent Living Organization (SILO); Suffolk County Aged, Blind and Disabled Community Assistance Program; American Association of Retired Persons' (AARP); Cornell Cooperative Extension; the New York State Division of Homeland Security and Emergency Services; Helen Keller Services for the Blind; Retired Seniors Volunteer Program (RSVP); Senior Net; Operation-Initiative Foundation; Parker Jewish Institute; Hamptons Center for Nursing and Rehabilitation; Touro Senior Law and Tax Services; and Mather Hospital. For more information about the event or the resources available to senior citizens in Suffolk County, please contact Legislator Anker’s office at 631-854-1600 or email ContactLegislatorAnker@suffolkcountyny.gov. Subject: LongIsland.com - Your Name sent you Article details of "Suffolk County Legislator Sarah Anker Hosts Senior Health Fair"